Couple who is looking some Honeymoon with some short of adventure can spend there memorable times here. Located in high altitude and secluded from hustle and bustle of other chocked hill station one can spend quality times here in the lap of mother nature. Drive to Pangong Lake is not a child play but its sheer beauty can astonise one or may be a shock for someone. On the other hand the Nubra Valley Fruit of Bawl of India is another paradise withing Paradie the biggest cultural shock will put in thinking mode for several days. So come and enjoy something different. Because its very different. Post breakfast it is good to start early morning to attend the praying ceremony at the Thiksey Monastery and other Monastery located close by. Overnight at Hotel. After an early breakfast we drive to Nubra Valley which leads through Khardunga-la-pass (the highest motorable road in the world) at 18390 ft, around 39 kms from Leh. Nubra Valley is popularly is popularly known as ldorma or the valley of flowers. It is situauted to the North of Ladakh, between the karakoram and Ladakh ranges of the Himalayas. First Visit SUMUR, a scenic village on the other side of the river, samstaining Gompa here was founded by Lama Tsultims Nima and Monastic community was introduced as Rezong Gompa. Overnight at Nubra in another beautiful village called Hunder. After your Breakfast at the camp, visit the sand Dunes to enjoy a camel safari (optional) later we drive to Leh over Khardunga la (The highest motarable pass of the World). Afternoon rest and relax or take a walk to the local Market. Overnight at hotel. Leave for Uletkpo camping which is one of the magnificent camping place in the Ladakh region. On the way, visit Spituk Monastery which is just 5 kms from Leh town. Continue drive to Alchi Monastery which is the only monastery in Ladakh on flat ground. By lunch time, you will reach Uletokpo. In the evening enjoy the calm sit on the bank of the river coming down from the Ridzong side. Overnight stay at the camp. After breakfast leave for Pangong Lake through Changla pass 5486 mtrs. While ascending Changla pass 5486 mtrs enjoy the beautiful panoramic view of the lakes below the pass. After crossing the pass halt for Picnic lunch at Tsoltak. The summer pasture lands of the Yaks. Arrive Durbukand from there short drive takes you to western shore of the lake. Enjoy the landscapes in the back drop of the lake. 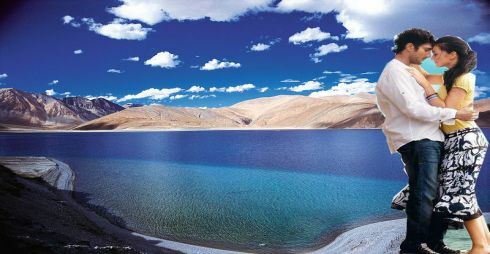 The famous blue brackish lake of Pangong is 5/6 kilometers wide and over 144 kilometers long. With half of its running the other side of the “INDO CHINA BORDER’. One rarely feels so close to nature and environment and the scenery is unforgettable. On arrival check in camp water mark. Overnight stay at Hotel. After breakfast drive back to Leh. On arrival hotel check in & free time for personal activities. Overnight at hotel. It’s time to say good bye to mountains, which definitely leave a mark on heart and soul and wish to come back soon. Transfer to the Airport for flight to Delhi. On arrival at Delhi Airport you will be transferred to Hotel. Rest of the day at leisure. Overnight at Hotel. Breakfast at the hotel. Check out & transfer to the airport for flight back home. Anyone travelling to altitudes above 10,000 ft (3300 m) may suffer from acute mountain sickness (AMS) unless properly acclimatized. The most common symptoms of acute mountain sickness are headache, disturbed sleep and loss of appetite, nausea, coughing, irregular breathing, breathlessness, lassitude and lack of concentration. If you are reaching Leh by air, it is important to take complete rest for the first 24 hours after arrival. Any kind of physical exertion should be avoided. Smoking and drinking should also be avoided till you are fully acclimatized. “Rest” means complete lying down in your hotel room without reading or watching TV.